The Vision of Grace Hill, Pt. 3 – can find JOY IN JESUS. The Vision of Grace Hill Church is to be a church where all people can find joy in Jesus. Today, we conclude a three part series on what that means. We study Matthew 13:44-46 to see what it means to be a a church that where all people can find JOY IN JESUS. 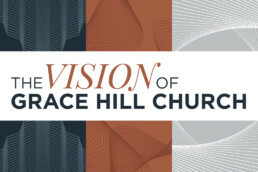 The Vision of Grace Hill Church is to be a church where all people can find joy in Jesus. Today, we continue a three part series on what that means. We study Acts 17:16-34 to see what it means to be a a church that is for all people. The Vision of Grace Hill Church is to be a church where all people can find joy in Jesus. Today, we begin a three part series on what that means. We study Acts 2:37-47 to see what it means to be a true, biblical church.